Yamaha Factory Racing’s Jorge Lorenzo (above) delivered a perfect performance today in the Gran Premi Aperol de Catalunya taking an impressive victory over Dani Pedrosa and Marc Marquez. This is Lorenzo’s second consecutive Grand Prix victory, his third of the 2013 season. Saturday had seen Dani Pedrosa smashing Casey Stoner’s 2008 lap record en route to an impressive pole position for the Repsol Honda Team rider’s 200th Grand Prix weekend. He would ultimately lose his lead on the drag to the first corner, after a scorching start from third on the grid saw the local hero pass pole man Pedrosa almost immediately for the hole shot into turn one. A classic Lorenzo master class followed with the reigning world champion maintaining a metronome precision over race distance to keep the two following Hondas of Pedrosa and Marc Marquez behind. On the podium with Jorge, Dani and Marc is Anna Vives the young Down Syndrome girl who designed Jorge’s helmet. 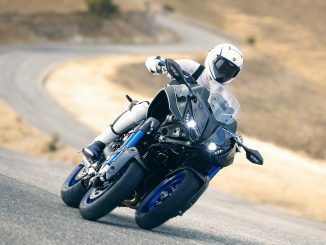 Two weeks ago, Lorenzo had sealed his second victory of the campaign in Italy. He now becomes the first rider to win three times in 2013, in the process moving to within seven points of championship-leading Pedrosa. This afternoon, the Mallorcan made the most of the battling Hondas to pull out a lead of over one second with four laps to go. 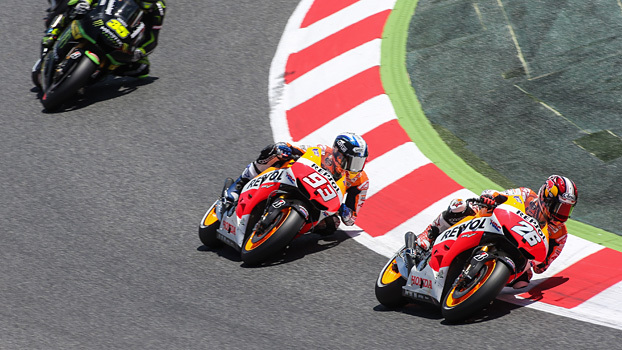 Repsol Honda’s Dani Pedrosa and Marc Marquez chased Lorenzo throughout, spending most of the 25 laps less than half a second behind the reigning World Champion, who stretched his advantage in the final few laps to win by just 1.7 seconds. Pedrosa’s second successive runner-up result – following wins at Jerez and Le Mans – means he retains the World Championship lead, with a seven-point advantage over Lorenzo. Repsol Honda’s Dani Pedrosa and Marc Marquez. Valentino Rossi (pictured above) rode a lonely race to fourth position while as many as eight riders retired, including Cal Crutchlow who crashed out on the sixth lap. As Yamaha Factory Racing’s Lorenzo moved to seventh in the all-time rankings for premier class race wins, with his 26th victory putting him one ahead of 1993 World Champion Kevin Schwantz, Pedrosa was forced to fight a rear-guard action even though Marquez had almost removed himself from the race on the penultimate lap. Heading into Turn 4 on the 24th of the 25 tours, Marquez suffered a significant scare and came perilously close to losing the front end of his bike. He would go on to reduce a six-tenth of a second margin to finish the race just six hundredths behind Pedrosa, although the key to his day had been a strong getaway from sixth on the grid. The leading CRT rider for the sixth time in as many Grands Prix this season, Power Electronics Aspar’s Aleix Espargaro finished eighth for the second race in a row, while GO&FUN Honda Gresini’s Alvaro Bautista was upset to have crashed on the opening lap following a near-miss with Valentino Rossi’s Yamaha. Also in the gravel at the La Caixa corner were PBM’s Michael Laverty and Ignite Pramac Racing’s Michele Pirro, although the Italian went on to finish tenth. The high attrition allowed an assortment of riders to enjoy their best races of the season, including Australian newcomer Bryan Staring (pictured below) who finished 14th to score the first points for the Gresini CRT bike. Scoring on his debut was Avintia Blusens’ Javier del Amor, substituting for Hiroshi Aoyama who had injured a finger on Saturday. 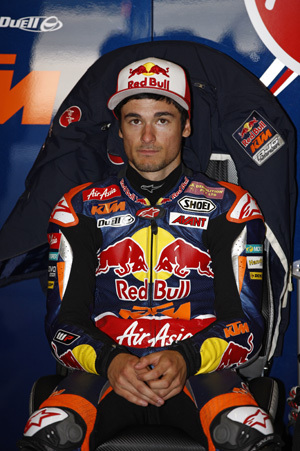 Six races into the 2013 MotoGP campaign, Dani Pedrosa leads Jorge Lorenzo by the further reduced margin of seven points. In the Constructors’ Championship, Yamaha has moved to within four points of the leading Honda. The battle will continue in The Netherlands, with the historic Iveco TT Assen on Saturday 29th June. Pol Espargaro has claimed his second victory of the Moto2 campaign, after fending off teammate Esteve Rabat. In third place, Tom Luthi returned to the podium for the first time since Brno 2012. Pol Espargaro receives congratulations from brother Aleix. It was a race of high attrition in which 11 of the 34 starters failed to make the finish on another warm afternoon in Catalunya. On Saturday, Espargaro had taken pole position and was only headed this afternoon when he allowed Tuenti HP 40 teammate Rabat through, only to retake the lead on Lap 17. Rabat mounted a strong attack on the final lap and would be less than one tenth of a second behind at the finish line. Several riders ran into trouble, not least Blusens Avintia’s Toni Elias who was caught up in drama at the first corner. It was also a disappointing conclusion for reigning Moto3™ World Champion Sandro Cortese (Dynavolt Intact GP), who pitted after going off at Turn 10, and Jordi Torres who crashed his Aspar Team Moto2 bike out of the race in the middle of the first chicane on the 18th of the 23 laps. 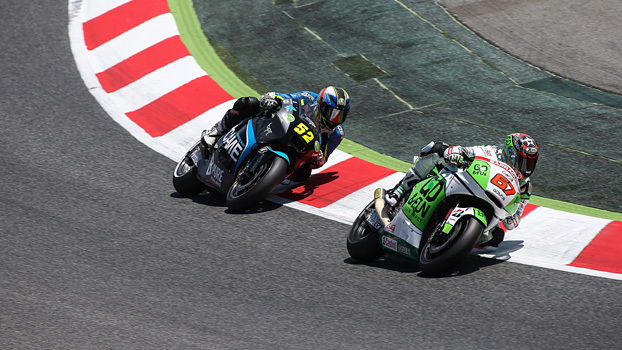 Scott Redding maintains his championship lead courtesy of fourth place for Marc VDS Racing Team, with Takaaki Nakagami fifth for Italtrans Racing Team. Luis Salom has won Moto3 to take the lead in the World Championship. The Red Bull KTM Ajo rider carried out a well-judged race, saving tyres before hitting the front in the closing stages. Alex Rins and Maverick Viñales completed the podium as the top five places were filled by Spaniards. Aussie Arthur Sissis lands a top ten finish in Moto3. 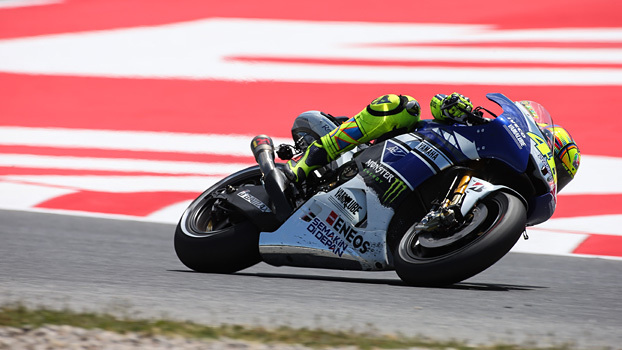 The race featured several leaders early on, including Estrella Galicia duo Rins and Alex Marquez as well as Team Calvo’s Viñales, although Salom had already provided the clues by sealing pole position on Saturday. Heading into the final two laps, Marquez and Mahindra Racing’s returning Efren Vazquez fell back which ensured a three-rider fight at the front; despite the best efforts of Viñales in the stadium section at the end of the lap, Salom had pulled out enough of a cushion on the back straight. Behind what was the leading group for much of the afternoon, Miguel Oliveira rode the second Mahindra to sixth place as Jack Miller (Caretta Technology – RTG) finished seventh after running as high as third. The top ten was completed by Alexis Masbou (Ongetta-Rivacold) and Salom’s Red Bull KTM Ajo teammates Zulfahmi Khairuddin and Arthur Sissis. In 15th place, San Carlo Team Italia’s Romano Fenati finished in the points for the third time this year. nice. do you know about Marc Márquez has Girlfriend or Wife?